Call of Duty: World at War for the DS (herein referred to as W@WDS) is Activision’s handheld translation of the mega hit released on PC and all current gen consoles. The DS version of the release was developed by n-Space and released in November of ‘08. This take on the FPS can be picked up at low-cost from most game retailers. In an overcrowded market of first person WWII games, the Call of Duty franchise has historically stood above and beyond the line of competitors praised for multiplayer, battle representation, and the esthetic appeal we’ve come to expect. So how does this translate to the handheld version of the second best-selling game of ‘08? W@WDS begins with a brief training session in which the user is introduced to the navigation and controls that the DS has to offer. The stylus is used for movement of vision, the directional pad navigates the character around the map, while the L button fires weaponry. The controls are challenging to get used to at first, but come with more ease as you continue through the game. As you and your squadron work to defeat the Japanese and inevitably make your way to securing the castle, you get to understand the enemies and the best way to approach them. Generally, your crouch and cover method is a practice in patience that leads to each battle’s success. The story continues by offering some British POV missions before returning to one of our initial protagonists Dimarkurato. Each battle is fought with relative ease allowing for satisfaction in gaining achievements as you meet certain criteria during gameplay. Your squadron acts as support and guidance during the game and is full of visual and verbal ques. The voices portraying your squadron are assertive, direct, and to the point, while the music and sound are what make the game more engaging. The game has a surprising level of complexity and includes some interesting uses of the stylus. In small side tasks necessary for completing missions such as the disarming of land mines and transmission of mores code, you are inadvertently subjected to slower, suspense building moments, usually following a battle. The war room is used to track statistics and achievements and is accessible through the main menu while your inventory appears in the touch screen of the DS along with a Plainview map. One of the most disappointing aspects of the handheld release of this widely renowned title has to be the multiplayer aspect. The multiplayer short fallings comes not from the multiplayer gameplay itself but rather from the fact that to find ANY W@WDS players on the DS’s WIFI system is next to impossible. IF you are able to link up with your friends to play, you will not be disappointed, but you will neither be impressed, unless of course you have never played a PC or console FPS multiplayer game before. So what is the appeal of the portable FPS? Understanding the desire to release the title on all platforms and thusly being available to potentially every gamer out there, one can not help but feel that this is one of those situations in which the genre does not translate. Of the FPS’s available on the DS, the Call of Duty franchise has done it justice with this title World at War but lost in a sea of sim games, puzzle games, RPGs and niche market releases, it seems the FPS player is not quite the DS demographic. 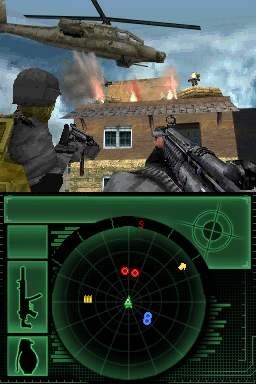 With a long history of FPSs, it is hard to compete with the intensity, atmosphere, superior graphics and over all experience of the PC, and increasingly, the console first person shooter encounter. The very nature of the point of view play lends itself more naturally to large screens, loud speakers and online or LAN multiplaying experiences that can not be duplicated in a hand-held device. Having stated the above, Call of Duty World at War for the DS is a formidable translation of the FPS genre and one that can be taken on the travel. This game is currently inexpensive and a solid gaming experience worth a pick up for any adult gamer, but perhaps not the dedicated FPS gamer, who perhaps isn’t likely to own a DS.